Street Address No.136, Nanhua Rd., Xinxing Dist. 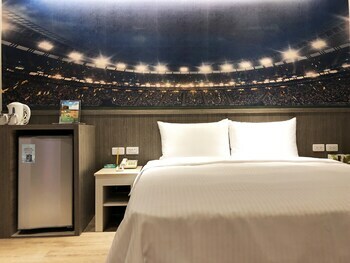 With a stay at La Hotel - Baseball Theme Hall in Kaohsiung (Sinsing District), you'll be within a 15-minute drive of Kaohsiung Museum of Fine Arts and Dome of Light. Featured amenities include a 24-hour business center, complimentary newspapers in the lobby, and a 24-hour front desk. Free self parking is available onsite. With a stay at Meet B&B in Baisha, you'll be within a 5-minute drive of Penghu Aquarium and Chihkan Pier. The front desk is staffed during limited hours. Free self parking is available onsite. With a stay at Seaview House in Hengchun (Big Beach), you'll be minutes from Kenting Night Market and close to Kenting National Park. The front desk is staffed during limited hours. With a stay at Fifteen One B & B in Hengchun, you'll be convenient to Mt. Guan and Guan Shan Fude Temple. Free self parking is available onsite.